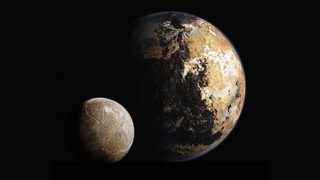 In July, New Horizons will pay a visit to Pluto and Charon. The historic flyby is expected to reveal surface features of these objects in extraordinary detail. Now, NASA and the SETI Institute, along with the International Astronomical Union, want your help naming these features. When New Horizons zips past Pluto on July 14, the science team won't have enough time to come up with the names of features. This is why the public has been asked to vote on a list of names, or suggest their own, in advance. "Pluto belongs to everyone," noted New Horizon science team member Mark Showalter in a SETI Institute statement, "So we want everyone to be involved in making the map of this distant world." Hmm, not sure why Indiana Jones is on there, but whatever. Great to see so many scifi nods, both past and present. Voting ends on April 7, after which time the New Horizons team will sort through the names and submit their recommendations to the International Astronomical Union (IAU). The IAU will then decide how the names are to be applied. A few years ago, a similar campaign was used to name the two smallest known moons of Pluto, Kerberos and Styx. "The difference is that last time we only needed two names, whereas now we could need more than a hundred," said Showalter. "We are eager to gather recommendations from people all over the world." Let us know your votes in comments!